Book Your Free Chicago Downtown Birthday Packages/ Bus Package/ Bachelorette Party With Us And Receive Free Cover & Discounted Bottles Service All Night! Anjunadeep comes to Chicago on this special Saturday as part of a stop on their North America 2015 tour. 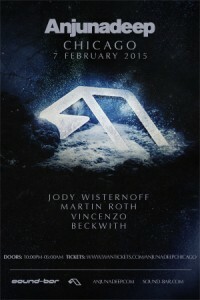 Jody Wisternoff, Martin Roth, Vincenzo, and Beckwith will take you on a musical journey throughout the entire night. Do not snooze on tickets for this event or table reservations. It will sell out!